A new social contract for Russia? Although the protest movement in Russia is waning, society and authorities are still at odds. The only way out is to learn to find compromises. Click to enlearge the image. Drawing by Niyaz Karim. This autumn’s sentiments are a special cause for concern in Russia. Both citizens and authorities are worried. Following the earlier outburst of protests and the reaction of authorities, the situation in the country is in for some scrutiny. This is happening on three levels: on the level of the political class, the middle class and the working class. 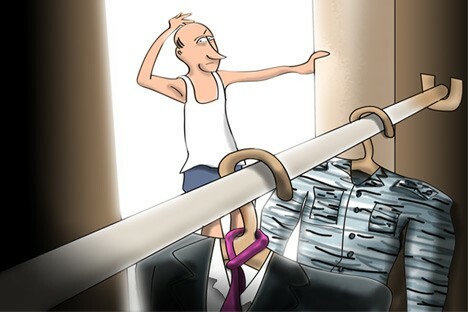 Experts are sure that the government’s summer initiatives – the increase in housing and utilities prices, the establishment of libel as a crime – will change the attitudes in one of the social groups and, ultimately, the behavior of the whole society. The new socio-political cycle that traditionally begins in the autumn has three main features. First, there are the controversial legislative initiatives put forth by the authorities. Second, there are the growing alarmist sentiments among many experts and analysts who feel that, in spite of the illusion that the situation is under control, the slightest change that occurs by accident or design may bring fateful changes to the whole social situation (see Olga Kryshtanovskaya’s opinion on next page). Thirdly, the wave of opposition is subsiding, causing dismay in some quarters and gleeful smiles in others – but certainly not fear. What, then, is prompting new initiatives, such as the extension of the definition of “state secret,” the drive for “clean hands” in parliament, the threats to shut down YouTube and the increased vigor in protecting religious views? Political scientists offer two explanations. Some think that all this is being done with the future in mind – just in case. Others believe that the authorities, as one scholar has suggested, are pursuing “an intelligent reactionary policy,” the main aim of which is to scare the urban middle class. That is why “patently ill-designed laws” are being passed. The aim has been achieved and the protest movement has lost momentum. As one of the opposition members put it, “the wave is subsiding and is not being reproduced in new formats.” The summer brought some creative ideas, such as the “protest walk” of writers and Occupy Abai. By autumn, however, things had been reduced to unreliable and ineffectual street rallies. Its most creative element – the angry urban dweller – has run out of steam and returned to day-to-day life. The remaining elements are either not dangerous or are committed to “actions,” which makes them easy to suppress. Perhaps the members of the protest movement have sensed this. Everyone noticed the leftward shift in the agenda and the speeches at the latest rally. This signals an attempt to broaden the protest circles by bringing in more marginal, and certainly left-leaning, sections of society. There are some other, equally important circumstances. The urban dweller is scared, but he does not fear being arrested; he is afraid that the situation may get out of control and lead to uncontrollable consequences. The fear of revolution outweighs the thirst for change, both in the elite and in the middle class. The ruling class might interpret this choice as a victory over the rebellious citizens who had been led astray by extremists and “enemy agents.” That would be a mistake. Even philosophically-minded observers are convinced that the seeds for a re-evaluation of reality have been planted. They compare the situation with the 1960s, when the moral foundations of a whole generation were established. Another parallel is France during the Revolution, which was then followed by the Restoration. It took the loss of human lives, political reaction and Thermidor to gradually build the institutions that protect human rights and property and maintain a flexible political system. Another possibility is the marginalization of the protest movement. Many of the administration’s initiatives have broad voter support; but the interests of the people are not always identical to the opinion of the majority. “The search for means” has already begun. Everyone understands that, should a second wave of the crisis strike, it will have dire consequences for Russia. Everyone will be affected, including the powers that be. This is one reason why political forces of various stripes have chosen to stand together, shoulder to shoulder. The third problem – one that sooner or later will require actions as well as words – is that there can be no question of any post-industrial development for the country without a class of “urban modernists” who are successful, mobile and well-educated. The authorities and the urbanites will have to make a deal. They would be pushed in that direction by the global crisis, since there would be no guarantee that everybody who wished to leave Russia in the coming years would find a job in Europe and the United States. Far from it. Indeed, some of those who have left may come back, creating more tensions in their demands for a decent life and a decent place in life. So far, lacking the opportunity, desire or the means to come to an agreement, each social stratum is again trying to withdraw into its shell. Power wants to remain in power, the citizen is concerned about providing the bare necessities for himself and his family, and the average man seeks to survive and preserve what he has. But the traditional system of coordinates has already shifted. “We are once again at loggerheads,” a leading sociologist believes. In his opinion, there are two options: to continue tightening the screws without “loosening any” and proceed from expediency in combating somebody or something, or, to move from one strategy to another, keeping in mind the new circumstances and social sentiments. Sociologist Olga Kryshtanovskaya talks about the political risks facing the Russian authorities. Svetlana Babayeva: Your recent statements have been distinctly alarmist. Why do you think that the situation in Russia is explosive? Olga Kryshtanovskaya: Think of the collapse of the Soviet Union. There was nothing to foreshadow an early collapse. The system seemed weakened, but still strong. The same is true of other revolutions: they brew a long time, but the collapse is quick. A domino effect sets in and, before you know it, disintegration cannot be stopped. The question is what triggers it. S.B. : It is impossible to foresee things in an unstable situation. O.K. : Not exactly. The pretext may be accidental, but the potential triggers are known. First, there are elections. All recent revolutions have been connected with elections. This was the case in Ukraine, Georgia, Kyrgyzstan and in the Arab world. The second type is man-made catastrophes – especially if they are on a large scale or occur in rapid succession and the opposition succeeds in convincing the people that the authorities are to blame. Natural disasters that put the population under stress can also act as a trigger. Think of the theories discussed during the Krymsk disaster (link). The fourth factor is economic upheaval. The fifth – arbitrary acts of the judicial system. S.B. : Catastrophes happen and give rise to stormy discussions and outbursts of wrath, but do not bring about radical change. All the social strata prefer the status quo. O.K. : Protest is like a pyramid. At the top are those who seek to gain power – the politician-revolutionaries. Further down are the fanatics and the reckless youth. Even further down are the activists and, below them, the sympathizers, which are made up mainly of the intelligentsia and students. At the base of the pyramid are the broad socially disadvantaged masses which have yet to be drawn into protests. Why do opposition leaders call these actions “marches of millions?” Because their target is a million people. S.B. : What could make such a huge crowd take to the streets? O.K. : So far, not much. But this does not mean that the protesters cannot stir up those at the bottom of the social heap. That could happen under certain circumstances. Then things would really get dangerous. The mob is irrational and spontaneous, but spontaneity can be controlled. The crowd has its ideological leaders, the reckless youth who have yet to realize that they have something to lose. Radical actions require structure, combat units, money, communications and networks. All of this is already there, in varying degrees. All that is missing is a trigger. S.B. : If someone decides to act, the authorities have much more powerful resources to stop all of this. O.K. : The authorities always have superior strength and resources. Nevertheless, revolutions do happen. Cracks appear in the establishment, grow deeper under the influence on the streets, and eventually blow up the situation. In reality, there are cracks. I see signs of the power structure becoming unwieldy and the fragmentation of the elites. O.K. : During his presidency, Dmitry Medvedev started rejuvenating the elite. Although the average age of Putin’s elite is quite normal by world standards (54), Medvedev’s appointees in the civil service are about 15 years younger than their predecessors. The younger generation is breathing down the necks of those whose positions they covet. This can’t help but irritate part of the political class. A generation gap has emerged. The second cause of fragmentation is the creation of two power centers. Cracks have appeared within the administration. Furthermore, there is the political reform for the return of gubernatorial elections. The system can no longer guarantee victory for the loyalists. If this is so, the contract changes within the elite – loyalty in exchange for guarantees. This means that tectonic shifts in our political system have begun. O.K. : It is necessary to calm people down, presumably by strengthening the government and its leader. A strong leader will restore the confidence of the elite by punishing some, backing others and helping yet others. Some people will return from the streets to their homes. A minority will become radicalized. Law enforcers know how to combat radical elements. But the question remains, what next? The problems that have prompted the protests did not go away. The system must be modernized quickly, to make it flexible and capable of reacting to challenges. Time is running short. Otherwise there will be a social explosion. Olga Kryshtanovskaya is the head of the RAS Sociology Institute’s Center for the Study of Elites, Professor Emeritus at Glasgow University, Doctor of Sciences (Sociology) and author of Anatomy of the Russian Elite.